This special clematis, C. 'Błękitny Anioł', Trade Designation BLUE ANGEL, is spectacular in flower and has an easy growth habit. It was raised by Brother Stefan Franczak in 1987 and registered in 1988. Brother Stefan is a Jesuit Monk. On joining Monastic life, he was assigned to the kitchens, but relatively quickly he progressed to the garden area where he showed his gift of being able to propagate new varieties and had the time to extensively trial his plants before he was happy to introduce them to cultivation. 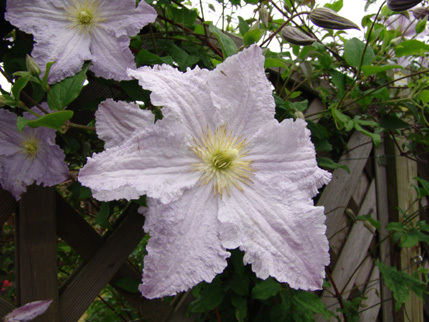 Throughout the world he is recognized for the quality of his clematis blooms, linked with ease of growth, although in Poland he is possibly better known for his breeding work with Hemerocallis. 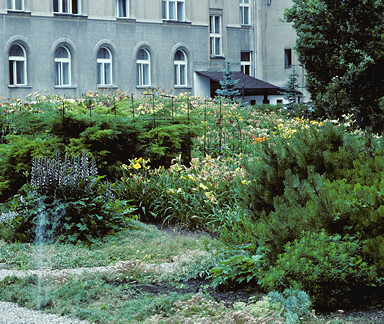 In 2002 we had the privilege to visit the monastery garden where he worked as part of the I.Cl.S. visit to Poland, where we were shown his clematis trial beds and some plants that were ready for introduction. But for me, the Hemerocallis beds were really spectacular, showing a range and vibrancy of colour in strongly growing plants - a sight to behold. C 'Błękitny Anioł' BLUE ANGEL, because of its distinctive and special characteristics, has been introduced throughout Europe and most countries in the temperate world. It is instantly recognizable for its distinctive colour and shape, linked with easy growth characteristics. 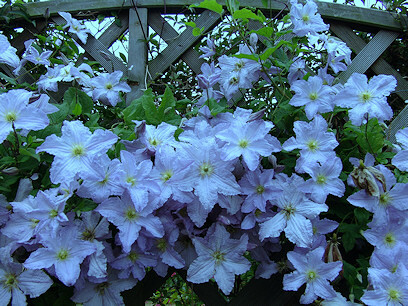 We had seen this clematis in flower in many gardens, but it was the Polish visit that inspired us to plant it in our garden in 2003. 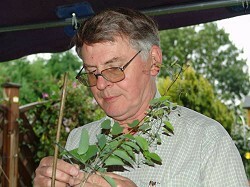 The parentage of C 'Błękitny Anioł' BLUE ANGEL is undisclosed or unknown, but fits easily into the Late Large-Flowered group, and Jackmanii and viticella could possibly exist somewhere within its make-up. The flowers are 100 to 150 mm across and a clear pale blue to violet blue. The "blue" in the name could be somewhat a misnomer as the flowers have the ability to reflect light of differing hues according to the nature of the received light. For example, in bright sunny conditions the flowers are perceived as a very light violet to almost light pink-violet, but in overcast conditions the flowers take on more of a light blue-violet hue, and in dappled light the flowers can take on the colour of a light blue sky. The central boss highlights a light cream-yellow centre. After regular pruning to within 300 mm of the ground in late February (in England) the plant will quickly and reliably grow to 2 to 4 metres (2.5m in our light chalky soil). The flowering period is from June to September, but is at its best in our garden in July and August.